The barges built for transporting goods along the Wey evolved a style all of their own. The early barges were huge vessels capable of carrying up to 90 tons, a considerable weight to be hauled by a single horse, and indeed often hauled by hand using the muscle-power of the bow-haulers. 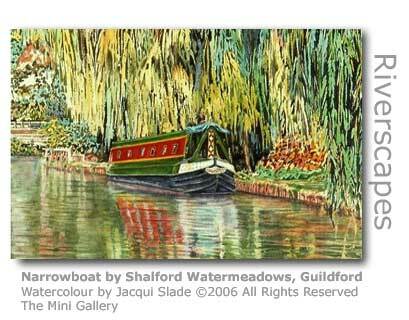 Later the smaller narrowboats were evolved providing greater flexibility of access and enabling smaller cargoes to be turned around quickly. When barges reached Town Bridge in Guildford the towpath was blocked for a short stretch. 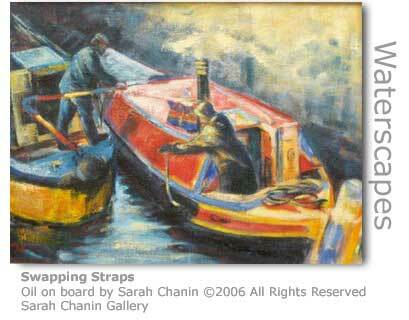 The carters overcame the problem of keeping the barges moving by walking the horses upstream, and rejoining the path. At that point they would tie the towrope to a piece of wood, and then float it back down to the bargee who could seize it and hitch it back to the barge. A major cargo hauled down the river to London was gunpowder. This highly volatile product cost the lives of many of the workers at Chilworth Gunpowder Mills during manufacture through explosions. The barge crews, who operated with barges marked by a broad red line around the hull, also unwittingly joined the fatality statistics when barges they were hauling exploded without warning. However transportation by water was much safer than by the rutted and subsided roads so gunpowder barges continued with their hazardous cargoes until well into the 20th century. The author and professional soldier Daniel Defoe (1660 - 1731) was quoted as saying that the Wey Navigation hade provided “mighty support to the corn market in Farnham” Defoe penned the novel Robinson Crusoe while a resident in the Wey Valley near Farnham. Up and down the inland waterways of Britain are numerous entrepreneurial boat owners who provide services from their boats. The Narrowshop offers an extensive range of jams, chutneys and marmalades; Working Boat Alton who offers coal, diesel and fenders for sale to other boats; NB Roach who are approved coal merchants; NB Blackbird for Christmas Gifts and The Cheeseboat, among many others. 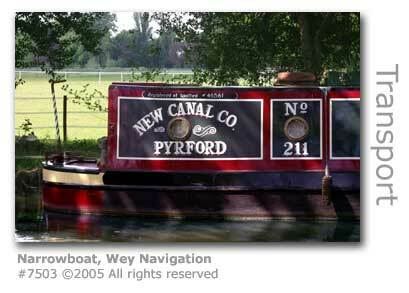 Barges were used from the earliest days of the operation of the two navigations along the River Wey. Over time the barge builders on the Wey developed their own unique design of barge, differing even from those being built later on the adjoining Basingstoke Canal. 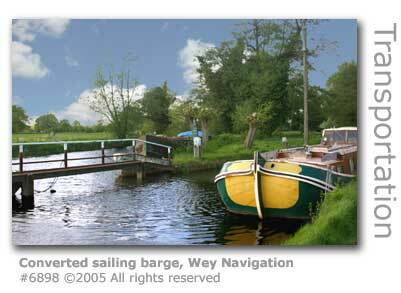 The barges on the Wey were 70ft (21.34m) long and 14ft (4.27m) wide, these dimensions dictated by the particular size of the navigation’s locks. The barges were broad-beamed freight vessels designed to carry loads along the length of the two navigations to and from the river Thames. Many of these barges would normally also be sailed along the Thames to offload and pick-up loads from the numerous docks along the river. Many of the barges were built to carry 80 – 90 tons. The original timber barges were built without heavy keels to save on weight and to minimise the draft of the vessel to avoid grounding. The lack of a keel significantly weakened the structure of the vessel and they would regularly spring leaks as the timbers twisted about. The bargemasters would often strap chains around the vessel when it was fully laden to keep the timbers together. The barge building centre for the Wey was situated at Dapdune Wharf in Guildford. The last barge to leave the Dapdune sheds was the Perseverance IV following a re-build in 1964-5. She continued to ply the river until being retired in 1968. A scale model of Perseverance IV is displayed in the Guildford Museum, Quarry Street. 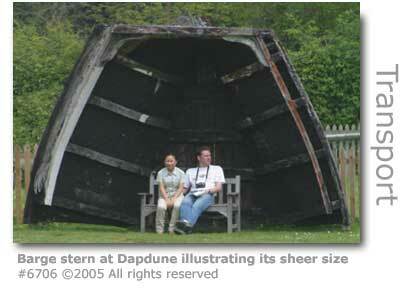 Two of the original Wey barges were tracked down by the National Trust in their quest to preserve one for display at Dapdune. Sadly the first they found had sunk in the Thames and was irretrievably imbedded in the mud. The second which had been abandoned at Leigh-on-Sea in Essex was reclaimed with the help of the local authorities at Southend. 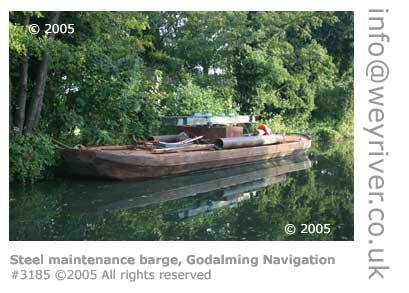 It was made watertight and refloated to be towed back up the Thames and Wey to its original launching site at Dapdune. The barge is now fully restored and displayed on dry land. 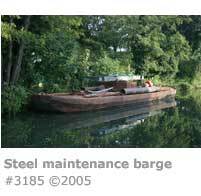 The skipper in charge of a barge was variously referred to as a captain, bargemaster, or bargee. Heavy horses were used in the early days of the navigations to haul barges, usually a single horse pulling a fully laden barge, which could weigh 80 – 90 tons, and at good walking speed from its position on the tow path by the river. However this was to change. During the nineteenth century it was increasingly common to see the bow-haulers hard at work, men working in teams to haul a barge as fast as any horse. 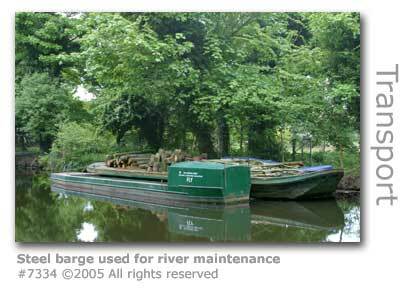 Barges were hauled all year round and in any weather. Flooding and strong winds were common, especially in winter periods, but still the cargoes had to get through. Delays or non-delivery for the bargee and his family would mean no pay and resultant hardship, so great risks were often taken. Fast-flowing water and high winds could whip the stern of a vessel out across the water, and often a donkey or pony was linked to the stern during adverse weather to prevent this from happening. Some of the Wey barges were equipped with distinctive red sails to improve their performance, although the high number of bridges spanning the Wey requiring the sail to be regularly furled and the mast lowered usually limited proper use to voyages to and from the docks along the Thames. These barges were limited to smaller cargoes than their 65 ton capacity, often not more than 45 tons, due to the weight of the sails and the restriction on the draft of the vessel in the relatively shallow water of the Wey. The firm Eastwood’s had a special requirement to haul heavy cargoes of bricks from Kent and Sussex to supply Weybridge and other locations along the lower Wey. They commissioned two stumpy spritsail barges, the Surrey and the Landrail, which were made by a boatyard in Sittingbourne to increase the efficiency of delivery over the traditional Wey barges. A spritsail (pronounced 'spreetsail') was a sail extended by a spar or sprit to increase the surface area exposed to the wind, with ‘stumpy’ referring to the fact that these barges had no top mast, hence reducing their height to make them more manoeuvrable in the difficult confines of the river. Sadly for Eastwood’s someone got their maths wrong, and one of the barges was built too wide for the Wey locks which added to the difficulties for the bargee. These barges had fan-shaped boards fitted on each side to prevent any sideways drift when under sail, and the only way the barge could navigate the locks was to have one of these leeboards removed and stored on deck prior to reaching the lock. With the introduction of steam engines it didn’t take long for the technology to be used on the Wey. The economics were quite simple. A horse or a team of bow-haulers could tow a single barge taking a day to make the journey from Weybridge to Guildford. A steam tug on the other hand could haul up to six barges leaving Guildford at 5.00 a.m. reaching Weybridge by 4.00 p.m. the same day, with time left to collect the next barges and start the return journey. Two tugs regularly worked the Wey with the tug ‘Teddington’ a regular visitor hauling grain barges to Coxes Lock Mill near Addlestone. The tug ‘Oasis’ was small enough to reach the wharves at Guildford. Over the course of the commercially-worked periods of the Wey Navigation a rich variety of cargoes were hauled up and down the river, each reflecting the changing needs of the time. The most regular of cargoes was the corn being shipped in to the prolific flour mills along the full length of the Wey, and the milled flour that they produced back-filled for the outgoing journey. Not far behind was timber, with numerous yards like Moon’s located at Guildford hungry to saw and prepare wood for use in shipbuilding, and the booming house building industry being fuelled by the enormous growth and prosperity being generated throughout the region. Other cargoes of any volume would variously include sugar, maize and barley; kapok, linseed and chalk; bricks, coal supplying local gas-works, bark for the flourishing tanneries, and rags supplying the paper mills. It wasn’t until the early nineteenth century that the narrowboats that tend nowadays to be associated with the Wey began to evolve. These are a uniquely British invention and provided a lot more flexibility for haulage along the river at a time when adaptability was a key consideration. The early versions were constructed of wood but the introduction of steel extended the working life of the vessels considerably. A typical narrowboat weighs 25 tons, is 70 feet (21.34m) long and 6 – 7 feet (2.14m) wide. Unlike the barges, which were undecorated, the owners and operators of narrowboats developed a new art of boat decoration which has been enthusiastically adopted and continued to the present day. The designs often incorporate roses and scenes of castles utilising symmetrical designs in red, white, green and yellow. Throughout Britain there are hundreds of different regional variations. The working narrowboats had large holds allowing just enough room for an engine room, with the advent of mechanised power, and resulted in extremely cramped living quarters, often no more than 6 feet (1.83 m) by 8 feet (2.44 m) for the bargee and his family. 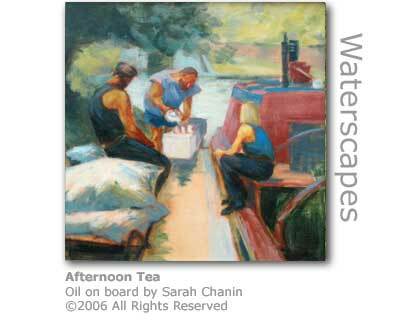 Life on board followed a tough daily routine often involving heavy hauling activity and in all weathers. Boat children received very little education given the nomadic nature of their lives, and were expected to assist in the running of the boat from a very young age. This often required leading the working horse which pulled the boat, or overseeing a mule used to rope the stern in during high winds and floods. Narrowboats were also towed by horses. 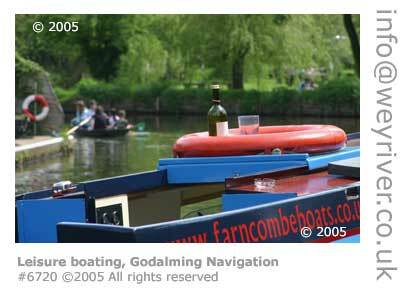 The only example today of a working horse-drawn narrowboat can be found operating along a short length of the Godalming navigation. The Godalming Packetboat Company provides two-hour trips along a picturesque stretch of the waterway in the NB Iona hauled by one of their two heavy horses. An experiment to provide electric power for barges was conducted in the early 20th century to provide a cost-effective method of propulsion through overhead power cables strung down the Wey Navigation between Guildford Town Wharf and Woodbridge. The project proved that it was practical but was never taken up as a going concern probably due to the initial cost of implementing it along the full length of the navigation at a time when other methods of transportation were undermining the long-term viability of water transportation. Coxes Lock Mill near Addlestone in Surrey was the last to employ barges on the Wey, with their traffic finally ceasing in 1969. There was a brief revival triggered by economic need when barge traffic was revived to transport corn from Tilbury docks with the cost of road transport hitting a record high. However two years later in 1983 the mill finally closed and so barge traffic on the Wey finally ceased completely. 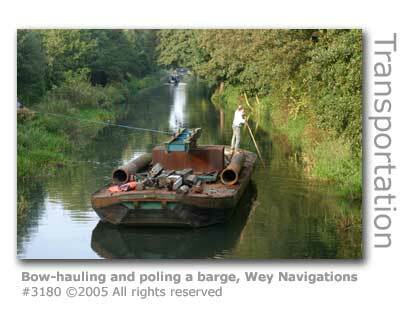 A regular feature along the Wey Navigations are ‘winding holes’ which are wider sections of canal to enable barges to make an about turn to travel back along the river. This often provides an indentation in the bank so that the bow of the boat can be held stationary to allow the wind to push the boat around – hence the term ‘winding’, and pronounced like the wind. Nowadays fervent debate is always assured whenever two waterway activists get to meet, especially when the subject of motorised vessels is raised. The propellers of engine driven boats can indeed cause disturbance beneath the water and resultant dislodging of plants and injury to water borne life. However there is a continued healthy interest from members of the public who want to use the navigations for pleasure boating, either with their own vessels or by hiring one, and their contribution to the cost of keeping the navigations open has proved invaluable, with the Wey remaining financially self-sufficient. The idea of living on a boat has always had romantic notions but with the massive inflation of property and land prices many people are now turning to buying and living on boats moored along the banks of British rivers and canals. Narrowboats with electricity, plumbing, heating and a mooring are available today (May 2006) at less than £10,000, even in central London. "The idea of living aboard a romantic, brightly painted narrowboat is hugely appealing to people weary of the rate race," says Sally Ash of British Waterways. "But it's a big step to take. Weigh up the enjoyment of the scenery, tranquility and a strong sense of community against the loss of home comforts such as a sewer connection, mains water and storage space. You need a licence, mooring, insurance and a safety certificate for the boat, so it's not always a cheap option." A registered residential mooring can cost from £40 to £200 per metre length per year. Moorings are usually short-term agreements that can be terminated at short notice. A 62ft steel narrowboat built in 2000 was sold recently for £56,000. The accommodation consisted of a saloon with solid fuel stove, galley kitchen, gas hob, fridge and freezer, bathroom with full-sized bath and shower and a double cabin, with a further convertible double in the saloon. Boat surveys in order to secure a safety certificate cost from £150, and older baots will need a more expensive full hull survey. 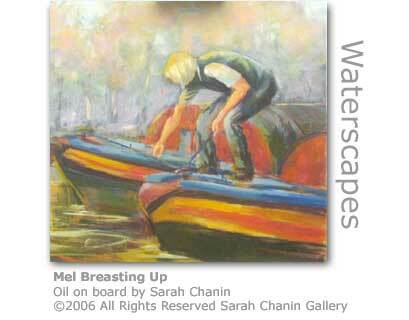 Boats also require regular painting which can cost over £3,000 if a specialist firm is used. Almost 12,000 people now live on boats in Britain new research has shown and boat ownership is growing fast with an increase of 2.5% last year alone. "There are more young people living on the river these days, along with retired couples and divorcees," said Beryl McDowall, chairwoman of the Residential Boat Owners Association. 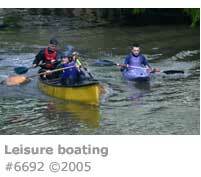 "House prices are playing a role in people moving to the river. Generally speaking people are very friendly. I like the freedom; if you don't like a place then you can up and move. You cab travel into the heart of a city, or into the countryside, and take your home with you." According to figures released by the Department for Communities and Local Government the average house price in the UK is £190,883. Compare that to the cost of a 60ft (18m) narrowboat which can start at £30,000 and the attraction of living on water becomes apparent. In reality boats providing greater levels of luxury become a lot more expensive and boat licenses, moorings, insurance and council tax on static residential moorings add considerably to the cost. Jan Wansell has lived on a 70ft (21m) narrowboat for three years and moors in St Katharine's Dock in east London in the winter and in Oxfordshire in the summer. 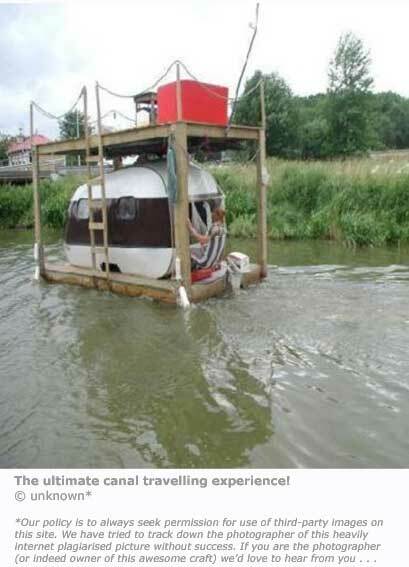 "This is a viable way to live by water in London in a sought-after location. It is very nice to be close to nature and there is something liberating about being able to move around," she said. Although not along the Wey, four river homes featured in the press highlight the appeal of living on the water and the huge variation in cost. The Dutch Steadman, an 87ft (26.5m) Dutch barge, is moored in the Thames near Putney. She offers four bedrooms, a 25ft (7.6m) wood-finished reception room and a 53ft terrace, two shower rooms, toilet and cloakroom. The price of £225,000 appears punitive until you compare it on an accommodation like-for-like with that on terra firma, and very unusually comes with the security of freehold mooring. A 57ft (17.4m) narrowboat, the Tim Tyler, moored on the Lancaster Canal can be secured for a mere £65,995. The boat has a single 9ft (2.7m) long master bedroom and a 17ft (5.2m) reception room. Even cheaper at £52,000 is a new 55ft (16.8m) narrowboat moored near to Nantwich in Cheshire. However for the ultimate on-river living you'd be advised to go for the Kajaco moored in London's trendy Docklands. A snip at £250,000 (and annual mooring charges of £8,500) this 1,600 sq ft (148 sq m) provides three bedrooms, a well-equipped kitchen and all within walking distance of Canary Wharf. The Wey is navigable from the Thames at Weybridge as far as Godalming. Upstream from Godalming the waters become extremely shallow in places although shallow draught vessels such as canoes do find it possible to navigate a few miles further upstream. However it should be noted that the river above Godalming runs through private land and there is no automatic public right of way beyond the Godalming Navigation Terminus. 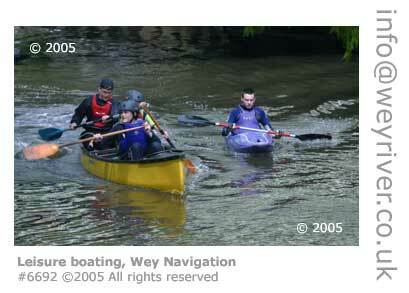 All water users of the Wey Navigations require a licence which is obtainable through the National Trust. 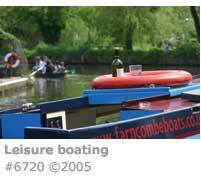 Leisure boaters can access public moorings along both Navigations although these tend to be for short-stay stops only. Longer stays require a permit and agreement with the owner of the canal bank concerned. The National Trust (who own and manage both Navigations) and organisations such as the National Association of Boat Owners (NABO) can provide guidance on mooring locations and mooring rights.